With the boat packed up the night before, we left town around a quarter after three in the morning. The moon shone bright above creating silhouettes of the windbreaks and power lines as we drove northeast. About 30 minutes into our drive we noticed a large patch of green northern lights that could have been quite spectacular if the moon wasn't so bright. On a trip to the same destination a few years back we were greeted with the northern lights dancing above the boat launch, we took this as a good sign. Our goal was to get to the Red River at Selkirk, long before the flock of eager anglers with their boats in tow. 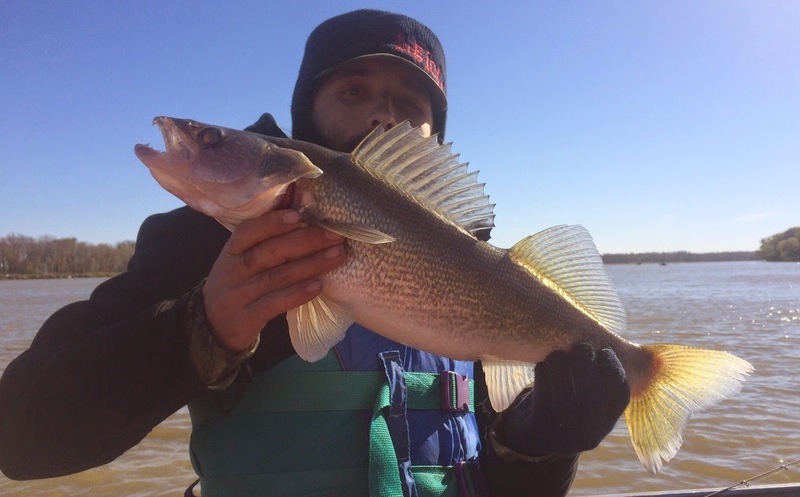 The target species was Walleye. With the wind from the south already blowing 30 kmh we made good time and were the first through the gate and off to the staging area before the docks. The wind had been from the north for over a week and had changed to the south the two previous days. Rain or shine, wind or no wind this was our one yearly trip here and we were going to give it our all. Since we were so early, we had agreed that we would take the opportunity to putter along south watching the electronics as we went looking for fish and possible structure. As the sun began to rise we fished a few different spots, the current was fairly strong most places so we sought out current edges and seams as well as outer bends in the river. If I was a fish in this river, I definitely wouldn't be spending too much time in the strong current if I didn't have to. There were surface breaches all around us early on, some big some small, some subtle and some full "Shamu". We were seeing fish on the electronics at almost every spot we tried and early on it looked like a Bald Eagle had spotted some as well. We all watched on as it circled above the river a few hundred feet away and began to swoop down to smash the water. It missed what it was after on the first attempt or possibly wounded it and was quickly dive bombing its prey again but with success this time. 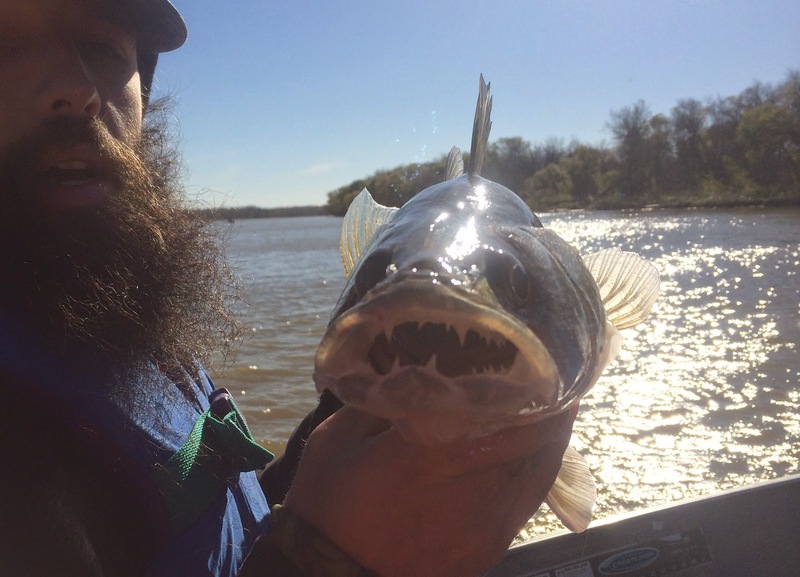 Off it flew with a 10 to 12 inch Walleye or Sauger in its claws. With how dirty this water is we all suspected it was dead and floating already. I have a lot of confidence in flasher jigs and that was what I was starting out with, missing a few bites over the first 90 minutes or so. I tried different weights from 1/4 ounce to 1/2 ounce, hook shank size and colours. Not a lot of success was being had, in fact only a few small Sauger and walleye as well as Stonecats were landed by Jay and my wife so we decided to push north up the river as far as the marsh if we had to. The vast majority of boats that would usually take up a lot of the community hot spots near Selkirk seemed to be up here or possibly off at Pine Falls. As we looked around however it seemed not very many were catching fish. A few bullheads and a Goldeye hit the rig Jay was using and I knew the Walleye wouldn't be far behind. After a few pounds of my jig on the muddy bottom, I let it pause for the blade to do its magic and BAM! Fish on! A few small runs and pulls under the boat and up it came into the net, a nice 23 inch greenback. I prefer the 15 to 18 inch range for eating so this one was destined to go back and fight another day. With a few more Bullheads caught and the wind kicking up small whitecaps as it gusted over 50 kmh we decided to head into Netley Creek and see if there were any fish that might want to bite. All we found there was colder water and a LOT of traffic, folks seeking refuge out of the wind and others heading off to hunt for waterfowl. We were bouncing around in the boat as much as we were on the river, so we decided to look elsewhere for spots hopefully out of the wind along the way back to Selkirk. With very little luck at any spot we tried, somewhere around the bridge to nowhere we thought we would push all the way to the locks and see what things were like there. Small Sauger were being caught by a few folks on shore with most of them putting each one in a white pail to keep. The limit is 4 and it was obvious in the 30 minutes we fished there that many people were keeping way more than their limit. It is frustrating to watch and even more frustrating knowing our Conservation Officers lack the funding and numbers that they truly need to protect our provinces resources. At this point we had been on the water for roughly 11 hours with very slow action and a lot of area covered. We thought we would stop by a favorite area of hours on the way back to the dock to fish a little longer and boy oh boy am I glad we did.